They are special, and you make them more special! I’m from Holland so forgive me my poor englisch.. I was wondering how you made the picture on the top of this site, if you want the picture shine in the drop, how big must the picture be behind the drop? And how close stands the picture with the 0 and 1’s to the drop? Can you tell me what the exif look like? The picture is 4 inches or so from the drop and is 11″ square. The useful part of the EXIF info is: I use a 180mm macro lens, 1/100th sec at f/11 (or so), ISO 200. I am currently developing a power point presentation concering water sanitaion on board marine vessels. I would like to use your photo for my introduction slide. I am an engineering instructor at the RTM STAR Center in Dania beach florida. My I please have premission to use your photo for my presentaion? I’d be glad to license an image for your use. I’ll contact directly via email. Iâ€™m from Holland so forgive me my poor englisch..
i like water and water drops……..
Could I please have permission to use your waterdrop image with my class of five year olds who are learning about “Our beautiful World”. We are using some blue screen effects and would like your fabulous photo for a background. Thanks for asking permission before using the image. I have replied via email. Hi, I found your site and examples of your art while looking for pictures of water for the church bulletin I am doing. If I had more time I would have requested to use this one on the front of the bulletin, but instead found another picture to use. I did want to tell you though I find your photography interesting and it has given me the idea to maybe try to get some water drop pictures on my own when I get the chance. Thank you. BTW What is your policy for using your pics on bulletins (less than 25 copies) and/ or web pages. For example you can visit my webpage I have connected and see how I used the pic I have there now. your photography is simply awesome..
through ur photography u have shown us splendid beauty of nature which is much beyond the beauty of any body’s imagination. Hi. I came across your photography through reference of a friend; it’s incredible. With the easy access of cameras these days, I feel like photography is underapreciated as an art. Your work displays both the creativity and simple, yet intriguing, natural beauty of the earth. Thanks. I would also like to say that your naming of the pictures is quite interesting. I first viewed the entire collection without looking at their titles. But then, as I looked through them a second time, I paired the image with it’s name, and the drops suddenly became all the more meaningful. Human nature has a subconcious desire to assimilate one thing with another (especially the unaimiliar to the familiar) and the way that you named some of the photos bridged one miniscule, seemingly incomprehensible world, to one that we can relate to. Liquidated abstract representation. I’m gonna almost freeze the water I use now, add soap and try the glicerin. EXTREMELY valuable info! THANK YOU! HI.. Sir your work is great. The techniques you have mentioned are very extensive & too good for a learner like me. 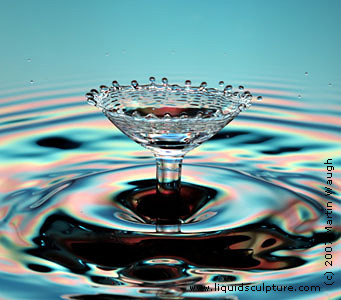 I have done the water droplet photography after going through your website & was able to get significant results. Thanks much for sharing the info!! im doing a portfolio for yr12 on water haven seen your work i wish to add u as an inspiration and write a little about you, its kinda required. Also add a couple of your pictures so my teacher can see what im talking about. i found a guy called Shinichi Maruyama he dose paint flying though the air witch i think you will enjoy some of his work. Thanks, Jennifer. I have run across Shinichi’s work and it is entrancing. I appreciate you drawing my attention to it. Best of luck with your portfolio. A metal wire has high tensile strenght as does liquid water at room temperature. And this doesnt happen either..My personal opinion is that surface tension is too complicated to be explained by classical mechanics of the highschool type and any attempt to do so just confuses matters..Real water is essentially quantum even in the classical view molecules have a dipole moment and its not clear whether this moment is oriented into the liquid out of the liquid or parallel to the surface..Just my two cents….comments please! I guess my difficulty is that I imagine water molecules to be like little gas molecules unable to interact except during collisions………………..My image cannot be right if your beam analogy holds up ! ………………..In the beam one can only understand the situation by assuming local isotropy and local homogeneity on a molecular scale . thank you very much for sharing these info. I was Googling trying to find a way to realize droplets with an higher viscosity! I’ll try with glycerin and see what I come up with. Your work is amazing !!! Thank you so much for the information !!!!! Just had to leave a note…these are the most beautiful liquid photo shots I have seen…amazing work!